Properly testing a MOSFET requires a lot of expensive test gear, but if you have a suitable digital multimeter you can do a pretty accurate go/no go test which will fail very nearly all dud MOSFETs. Nowadays most multimeters have a diode test range. On most multimeters (but by no means all!) this puts about 3-4v across the device under test. This is enough to turn on most MOSFETs - at least partially, and enough to test. The meters which use a lower open-circuit test voltage (sometimes 1.5v) will not make this test! So: connect the meter negative to the MOSFET's source. This is arrowed in the drawing above which shows the most popular TO220 MOSFETs. Hold the MOSFET by the case or the tab if you wish, it doesn't matter if you touch the metal body but be careful not to touch the leads until you need to. First touch the meter positive on to the gate. Now move the positive meter probe to the drain. You should get a low reading. The MOSFET's gate capacitance has been charged up by the meter and the device is turned on. With the meter positive still connected to the drain, touch a finger between source and gate (and drain if you wish, it matters not). The gate will be discharged through your finger and the meter reading should go high, indicating a non-conducting device. Such a simple test cannot be 100% - but it is useful and is usually adequate. What the test above actually measures is the pinch-off voltage: the highest voltage that can be put on the MOSFET's gate without it starting to conduct. The circuit below shows a better way. There are two push switches, one is a changeover switch, the second is a push to make (normally open). I use a couple of microswitches. It uses the diode test of a multimeter, or you could use any power supply, or a 9v battery, with a resistor in series with the MOSFET to limit the current. With both switches in the normal position, the capacitor C1 charges up to the open circuit voltage of the diode tester. The capacitor's value is not critical, 10n-100n is fine. 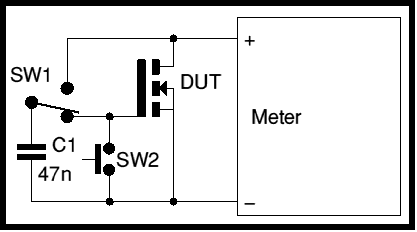 When Sw1 is pushed, the charged capacitor is disconnected from the meter leads and reconnected to the MOSFET gate. The MOSFET should turn fully on, so the diode tester will indicate a short circuit. Release Sw1. The MOSFETs gate is still charged. Only leakage will discharge it, so the MOSFET should still stay conducting for quite some time. Push SW2 to short the MOSFETs gate to source, to discharge it. The meter should show an open-circuit. Alternatively, connect the capacitor to meter +ve via a diode, to allow the capacitor to charge, Now when the capacitor is connected to the gate, the MOSFET will conduct but the diode will stop the conducting MOSFET from discharging the capacitor. Dying MOSFETs often emit flames - especially in home-built electronics. One wag on a usegroup said that the FET in MOSFET stood for Fire Emitting Transistor. In commercial equipment where the MOSFETs are protected from gross abuse, 'gentle' failure can occur and the MOSFET may look OK but be dud: however, usually if they look OK, they are! When MOSFETs fail they often go short-circuit drain to gate. This can put the drain voltage back onto the gate where of course if feeds (via the gate resistors) into the drive circuitry, maybe blowing that. It also will get to any other paralleled MOSFET gates, blowing them. So - if the MOSFETs are deceased, check the drivers as well! This is probably the best reason for adding a source-gate zener: zeners fail short circuit and a properly connected zener can limit the damage in a failure! 4QD also use sub-miniature gate resistors - which tend to fail open circuit under this overload, disconnecting the dud MOSFET's gate. If you want to learn more about MOSFETs in motor control, check our circuits section. By no means all makes/models of meters are suitable so I will list here ones of which I am aware. If you can add to this list, please contact me. Avo - Megger M5091 4.0 v Buzzer range.